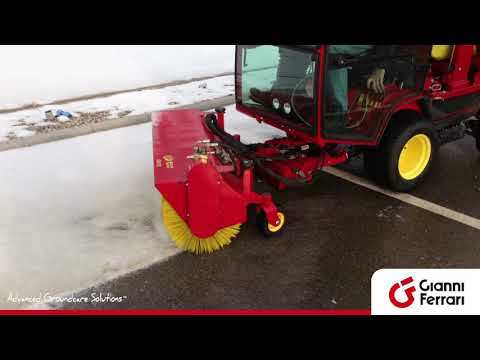 Gianni Ferrari PG professional machines are POWERFUL AND COMPACT. The turbine collection system is integrated in the machine: no external encumbering parts and with an unbeatable collecting capacity. 800L collector only available with 23” wheel and high discharge lift. 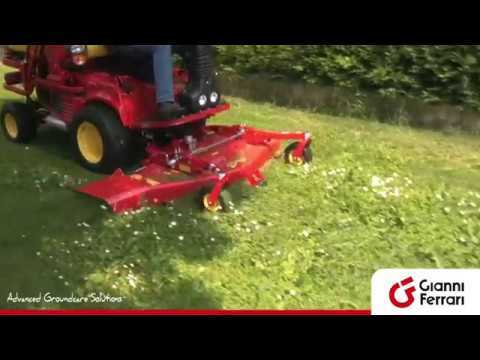 Gianni Ferrari PG is a multi-purpose machine for the maintenance of green areas and open spaces. 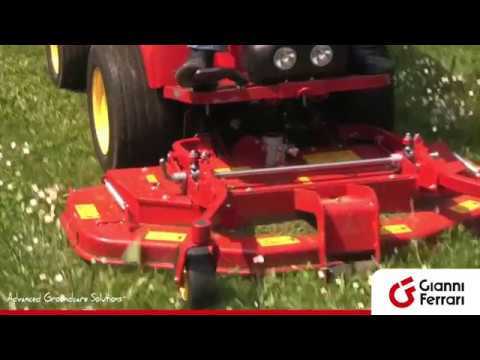 Specializing in cutting and collecting grass ... great in many other applications! and the effective suction turbine cleans and collects perfectly. 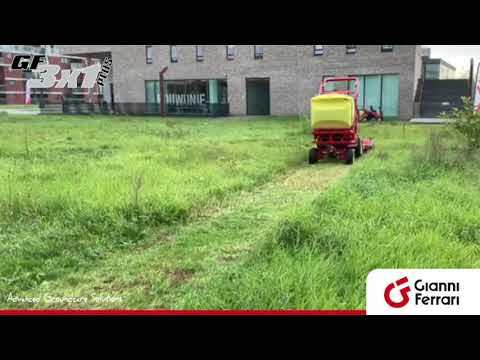 This is why PG machines are particularly useful in the maintenance of playgrounds, school courtyards, campsites and in all those situations where cleanliness and safety are essential for the enjoyment of green areas. With a powerful collection system cleaning is ensured and the appearance is impeccable. In addition, PG proves extremely effective in the collection of leaf litter. PG is a machine very much appreciated by sports clubs. 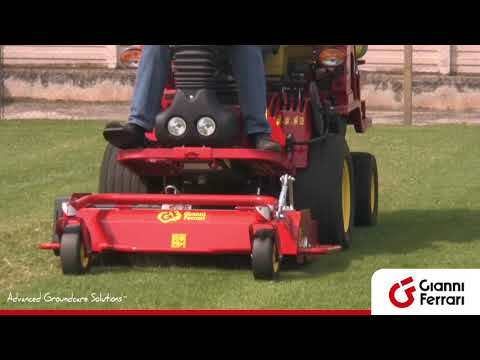 In fact, in addition to equipment for the maintenance of natural grass (mower, aerator / dethatcher, sand spreader), specific equipment is also available for the maintenance of synthetic turf as well as for cleaning athletic tracks. One machine and lots of equipment for a real team play! 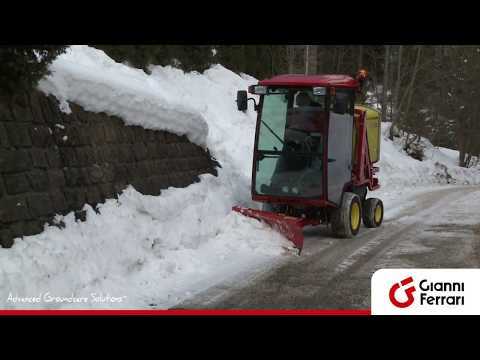 Its natural habitat are parks and gardens, but thanks to the more compact size of its class, PG even moves easily and effective in city traffic, including roundabouts, pavements and traffic islands, where it can also be used as a sweeper or equipped for snow removal. In addition, the PG diesel versions have achieved approval as self-propelled machines for road use. 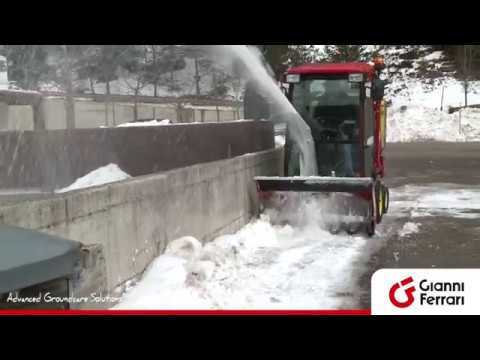 These characteristics make them particularly suitable for municipal maintenance, even in winter. A machine for all seasons. 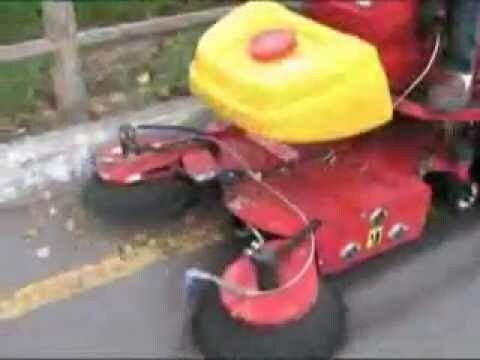 • ensuring permanent 4-wheel drive to benefit the safety of the operator. This is very important considering that, when turning, some solutions in the market disengage the traction on one or two wheels, thus losing the prerogative of the 4WD at the expense of safety. The PG range is equipped with professional, low emission petrol and diesel engines that satisfy the current anti-pollution directives. The two-cylinder petrol engines are equipped with a dual element air filter and pressure lubrication system with oil filter. These features increase the protection and durability of the engine. For maximum performance 3-cylinder diesel engines with liquid cooling are available. The combined water / oil radiator with anti-clogging fin is of generous size and ensures a high thermal exchange even in tough conditions, to benefit the longevity of the engine, oil and hydraulic components. The filter system with self-cleaning cyclonic pre-filter protects the engine and extends its life. The diesel models are equipped with an Eco-Drive™ selector for more efficient and comfortable use. In Eco-Drive mode, engine, power take-off and collection turbine run at reduced speed for good fuel economy and low noise level. In tougher working situations the Boost mode can be selected, where engine, power take-off and collection turbine run at full revs. The power steering acts on the rear wheels, ensuring precision and swiftness, reducing operator fatigue and working time. A version is available with rear twin-wheel for an extremely tight turning radius and easy handling. The 4 wheel version has an oscillating rear axle, enabling a tight turning radius, as well as stability and safety when crossing slopes. 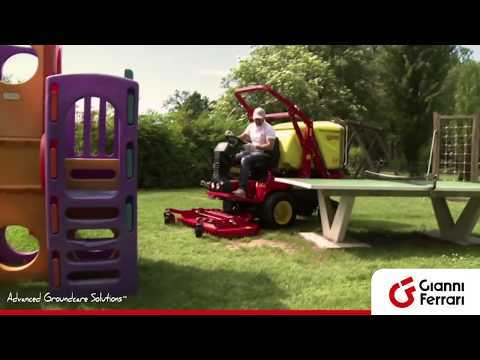 The driver’s seat is designed to be easy on the operator even after many hours of work. The steering column tilts, the steering wheel is ergonomically designed with soft grip and knob. The power steering is light and precise. A single pedal quickly and intuitively controls forward and reverse for ease of use. To adapt to the size and weight of each operator the seat is adjustable in depth and the seat springing is adjustable for height and stiffness. All controls are easily accessible and the hydraulic distributor levers are protected against accidental operation. In the diesel models a display provides information on the machine (hour meter, engine coolant temperature, fuel level, etc.). and diagnostics for the safety systems and system faults. 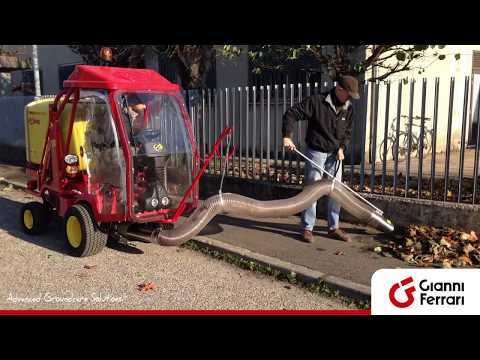 • the machine is versatile because the turbine and hopper are always available for use with various equipment. The large collector is made from sturdy impact-resistant material and is fitted with a filter, deflector and warning buzzer to indicate when the hopper is full. The filter is easily removable for cleaning. The buzzer advises the operator to disengage the PTO when the hopper is full, to prevent clogging the collecting duct. 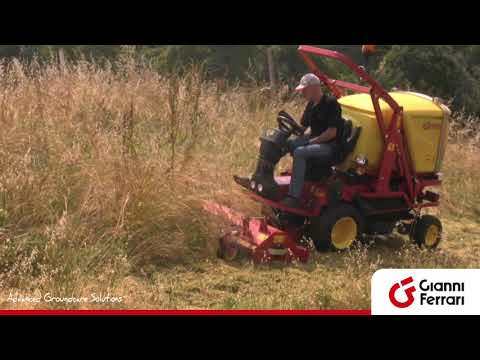 800 litre collectors are fitted with a motorised swivel spreader that compacts grass and fills the hopper evenly by making the most of its capacity. 4 wheel PG models can also be fitted with a lifting device. A parallelogram system with hydraulic drive allows the collector to be lifted up to 1.90 metres and emptied directly into the dump body of a truck or trailer. Emptying is also possible at any height lower than maximum, using the independent dumping control. In place of the foldable ROPS it is possible to install a fixed protective structure complete with roof. The ROPS protects the driver, should the machine overturn and the canopy provides shelter from sun and rain and protects the operator from branches when working under trees. A cab enclosure kit is available to turn the ROPS with roof into a soft cab. The soft cab offers good protection from the elements and maintains the ROPS safety feature. The kit consists of doors and rear transparent PVC sheet, with a Plexiglas windshield and manual wiper. A heated seat is available as an option. A hard cab with tempered approved glass windows is available for 4WD models. Ventilation system with dust filter and heating. Doors with external locks and assisted opening mechanism with gas springs. Hinged opening windscreen with electric windscreen wiper. Headlights and rear-view mirrors for road use. Rear work lights. Interior courtesy lights. The cab is mounted on silent blocks and can be tipped forward to allow maintenance access to the engine and transmission. Easily removable doors.A heated seat is available as an option.